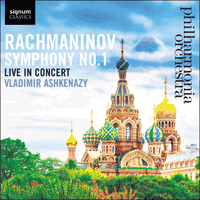 Inaugurating their latest collaboration with conductor laureate Vladimir Ashkenazy, the Philharmonia Orchestra performs Rachmaninov’s volcanic Symphony No 1. Rachmaninov composed the first of his three symphonies between January and August 1895, when he was 22 and had a teaching post at the Mariinsky Institute for Girls in Moscow; it was his third orchestral work. He submitted the score to the Society of Russian Symphony Concerts in St Petersburg, and it was accepted, subject to a few revisions. 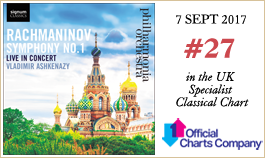 The first performance was given in St Petersburg on 27 March 1897 (five days before Rachmaninov’s 24th birthday), with Glazunov conducting. It was disastrous. Glazunov apparently conducted in an utterly ‘deadpan’ manner, as though he were directing a class in elementary orchestration, and Rachmaninov finally left the hall in fury and disgust—only to attend, later the same evening, a dinner arranged in his honour by the publisher Belyaev, at which all the important musical personalities in St Petersburg were present. ‘How could a great musician like Glazunov conduct so badly?’ he wrote to a friend after the performance. ‘It is not even a question of stick-technique, though his is poor enough, but of musicianship: he beats time as if he has no feeling for music whatever.’ The press (who were in any case prejudiced against the Moscow school) were highly abusive: Cui accused Rachmaninov of ‘morbid distortion of harmony and sickly addiction to sombre moods’, and declared that ‘if there were a conservatoire in hell and one of its students had been asked to compose a symphony on the subject of the seven plagues of Egypt and had written a symphony like Rachmaninov’s, he would have won a prize for it’. No wonder Rachmaninov tore up the score and refused to allow the work to be published. However, the orchestral parts came to light during the Second World War in the Conservatoire in Leningrad (formerly, of course, St Petersburg) and, with the aid of these and of the composer’s own reduction for piano duet, the score was carefully reconstructed by Soviet musicologists, and the resuscitated symphony was given its first performance for nearly 50 years in the Great Hall of the Moscow Conservatoire on 17 October 1945, by the USSR State Symphony Orchestra under the direction of Alexander Gauk. The irony of the affair is that, despite its obvious—and understandable—debts to Borodin and Tchaikovsky, the D minor symphony is in many respects superior in construction to Rachmaninov’s two other symphonies. Its first movement opens with a short slow introduction whose intial upward-sliding motif is to act as a ‘motto’, reappearing at the beginning of each succeeding movement (and elsewhere). The main theme of the allegro is an extension of the theme propounded in this introduction, and the second subject, Tchaikovsky-like, is a combination of three ideas announced in quick succession and in slower tempo. The development (beginning like that of the first movement in Tchaikovsky’s sixth symphony with a fortissimo explosion) starts off with a fugal discussion of the first subject and reaches its climax in a broad, chorale-like transformation of it, which suggests that the theme was derived from a chant of the Russian Orthodox Church. The second movement (in F major) is a scherzo of great resource and subtlety, notable for the economy of its scoring and for its vacillation between wistfulness and an almost ghostly eeriness. The ‘motto’ reappears about half-way through, and we may also detect a veiled reference to the ‘Dies irae’ theme that Rachmaninov was to use so effectively elsewhere. The larghetto in B flat major, also lightly scored for the most part, is in effect a rhapsodical meditation on a long, winding theme initiated by the first clarinet; there is a brief middle section derived from a dramatic incursion of the ‘motto’. The finale, basically and finally in D major, is anything but lightly scored: indeed Rachmaninov unleashes here a whole welter of orchestral sound. The movement could loosely be described as being in sonata form, but its episodic nature imparts a strong feeling of rondo design. The exuberant first subject (a transformation of the first movement’s main theme) and the soaring second subject are in strong contrast to one another, and there are numerous subsidiary ideas, including references to the ‘motto’. The movement ends with an expansive coda.